WATCH VIDEO BELOW BROOMBALL FIELD TRIP. Calendar above is shared ice for Broomball & youth stick n puck if their is a need to. ​Broomball (played like hockey but without skates) All ages! Call 810-744-0800 and rent the whole ice! 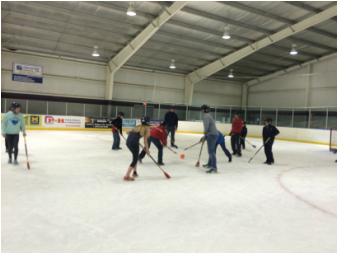 In a game of broomball there are two teams, each consisting of six players: a goaltender and five other players, typically two defenders and three attackers (two forwards and one center). The object of the game is to score more goals than the opponent. Goals are scored by hitting the ball into the opponent's net using the broom. The game of broomball begins with a face-off. Tactics and plays are similar to those used in sports such as ice hockey. A typical game of broomball is broken up into two 18 minute periods. You can also play Broomball with as many people as you want and split into two teams, with the object to score more goals than the other team. WATCH BROOMBALL: PEOPLE PLAYING FOR FUN! Game Basics: A game consists of 2 halves. A game consists of two, 18 minute stop time halves. Checking: Only Class A men's division games allow checking.